* loose leaf yerba mate tea (probably bagged one will be fine too, I prefer the loose leaf one as it tastes so much better than the bagged one. Actually I didn't think I like yerba mate until I tried to loose leaf ... the taste is that different). I put the loose leafs in the espresso machine. I know it sounds weird, but that's one of the recommended ways on the tea package + it is the way my local cofe shop makes it. I let the water run as for a long esspresso. Then I steam the milk. Of the six commonly used stimulants in the world: yerba mate, coffee, tea, kola nut, cocoa, and guarana, yerba mate is the healthiest, delivering both energy and nutrition. They say that the mate provides constant energy and do not cause the high energy spike followed by the low that usually coffee induces. This is the usual way the natives drink it.The natives prepare it by steeping dry leaves (and twigs) of yerba mate in hot water, rather than in boiling water like black tea. 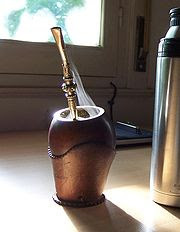 Drinking mate with friends from a shared hollow gourd with a metal straw is a common social practice in Argentina, Uruguay, Paraguay, Chile, Bolivia, Brazil and has been cultivated in Syria, Lebanon and Jordan. History: Yerba mate was discovered centuries ago by the indigenous people in South America and has been revered as the “drink of the gods” and consumed to enhance health, vitality, and longevity. With 24 vitamins and minerals, 15 amino acids, abundant antioxidants and naturally occurring caffeine, yerba mate triumphs as nature’s most balanced stimulant. Wow, thanks! Crisco said - "this sounds good - yerba mate - we should get some of that!" WOW excellent post, Dona! Very educational! Where do you buy the tea? This is a great post btw! The tea is sold in Whole Food or local co-op shops. I was trying to re-organize this post because I didn't like to way the pictures were looking... unfortunatelly something happened, one picture got errased, and it still looks not very well alligned. Do Marulka ili Lokuma use html when they post thiers since they seem much better organized? ha... i would have never thought that you can use the espresso machine with tea!